Leftists parse words so they can “truthfully” say they “can deny that there is any evidence that Obama ordered a wiretap of the Trump Campaign.” Leftists deny the truth with true lies. For people who condemn me for saying Obama is an Islamist jihadi, I can deny that I have ever said any such thing. I have said that he is a Moslem Trojan Horse for the Muslim Brotherhood’s Jihad to re-establish the Caliphate and renew Muhammad’s war to dominate the world, which is not the same thing. 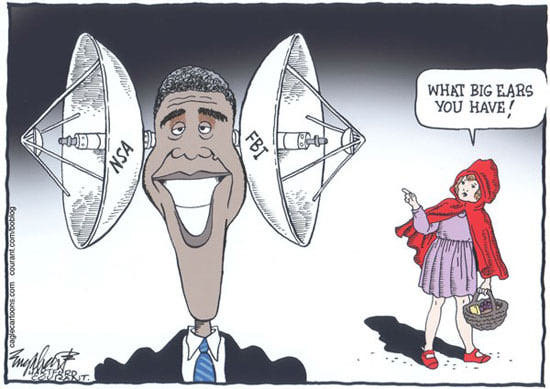 Likewise, just because the NeverTrumpers say they can’t find a written note from Barack O telling the NSA to wiretap Trump they say can declare that to be the truth without reservation knowing they are not lying, they are just deceiving. Trump’s declaration the Obama wiretapped his campaign is not “the insane ravings of a tyrant,” but the honest truth of anyone who has been reading the news for the past few months. The New York Times and other LDMSM even wrote stories about how wiretapping revealed secrets from the Trump Campaign. 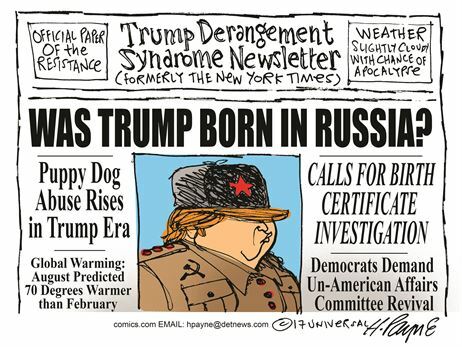 Now leftists are in denial mode. The NYT went back to their electronic media and changed the stories they wrote to take out the term “wiretap” so they can say any reference to wiretapping is a lunatic rightwing tinfoil hat conspiracy. But it still exists in the printed papers if people want to take the time to find it. This is how leftists deny the truth with a true lie. They will never find evidence a written note from Obama that says he is ordering the wiretapping of Donald Trump. Those in his inner circle will never admit that he told them he wants surveillance of the Trump Campaign to find evidence they are talking to the Russians. That’s how “plausible deniability” works. He didn’t specifically use the word “wiretap” as surveillance takes many forms. But the very fact that the LDMSM have been reporting information about the Trump Campaign and President Trump that could only come from deep government surveillance IS the PROOF! Alinskyites NEVER admit the truth. The Conman’s motto is “die with the lie.” Honest people have trouble relating to this. It’s takes intelligent people to see past the parsing of words to the actuality behind the words. A master attorney has great difficulty posing a question around which a skilled liar cannot wriggle his way out of the truth without telling a direct lie. Honesty is actually a very rare commodity, but not among politicians, lawyers, and spies who live in the world of deception and the twisting of words and the truth. Believe only half of what Republicans say and none of what Democrats say is the beginning of wisdom. Finding the truth for yourself or understanding that politicians and the media reveal only part of the story is the rest. Ninety percent of what is thrown about in the media is meant to mislead, deceive, and deny the truth in order to distract and corrupt the thinking of observers. Rachel Maddow attempted to smear Trump for taking $100 million in write offs on his 2005 taxes that were illegally leaked, but neglects to reveal that he still paid a higher percentage tax rate by far than her hero Obama. Once that was exposed the story became “Trump deliberately leaked taxes that would make him look good.” Where Obama tried to increase his presidential retirement salary before leaving office, President Trump is donating all of his to charity. This is the measure of the quality of these men. So always read any story with the eye of a skeptic. The media says President Trump speaks like Hitler. Listen and compare his speech to Adolf Hitler’s speeches and do the same with Obama. You will find the similarities with Hitler lie with Obama that the media tries to conceal and discover they are just throwing mud at Trump in the hope that some of it sticks. The Lying Democrat Mainstream Media never speaks the accurate truth. They only ran positive stories for Obama and never truly called him out on any of his multitude of lies like FOX did, but they run nothing but negative stories about Trump. They advocate for stupid people to vote for lawyers to govern the business of the nation through lies, innuendo, and misrepresentation rather than a businessman. Obama always claimed he was the most transparent administration in history even after Pelosi declared we can only read ObamaCare after they passed it. Donald Trump is what true transparency looks like and the leftwing media don’t like it. This entry was posted in Politics and tagged Barack Obama, Donald Trump, Honesty, Leftist propaganda, Liberal lies, Lying Democrat Mainstream Media (LDMSM), Obama Surveillance, Truth in Reporting, Wiretapping Trump Campaign. Bookmark the permalink. There is a reason to be why we get all riled up when the leftists do something ridiculous: they are all about inflaming emotions not political discussion. The best way to react to them is to stop and take a couple of deep breaths and the answer to their lunatic nonsense will come to mind. In this case, he doesn’t have to order it. 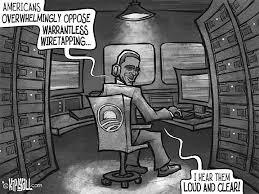 The security apparatuses set up by his predecessor enabled him to do to it without a warrant, FISA or otherwise. He did know about it; that is sufficient. Obama has escalated this to the point of no return: Trump either dons the brass knuckles or the country is going down the drain. Could there be bloodshed? yes. Here’s what eight years of Obama crimes look like. One wonders if he will ever be investigated concerning any of this.